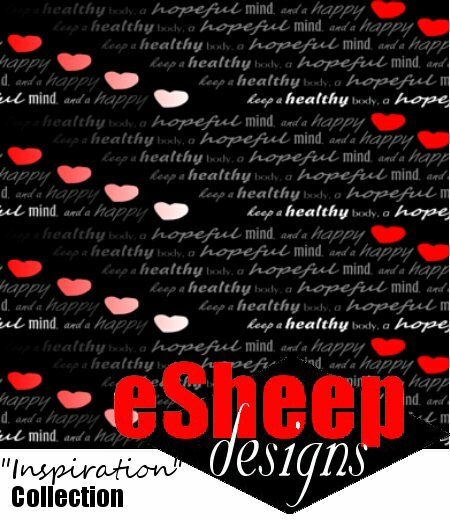 eSHEEP DESIGNS: Why Design Your Own Fabric? Why Design Your Own Fabric? Because if you sew, there's only one thing more satisfying than taking some fabric and turning it into something beautiful and useful: taking some fabric of your own design and turning it into something beautiful and useful. In my personal experience of coming back to sewing in 2012 and having this amazing journey that I've been blogging about for the past few years, the accomplishment that's been most thrilling is seeing my own fabrics come to life. If you're still sitting on the fence as to why you should dabble in fabric design, I've got some ideas from Spoonflower to share today that might make you jump off that fence. In between, I'll share with you the most recent additions to my Inspiration fabric collection. Who doesn't love a one-of-a-kind item that no one else will ever have? Well, that's the result you can achieve when you make things with fabric that you design yourself. This first one is a pashmina made out of custom fabric that tells the wearer's story (in this case, her business history to date). How cool — and simple — is that? Don't you think this would be a great gift idea for someone's retirement? 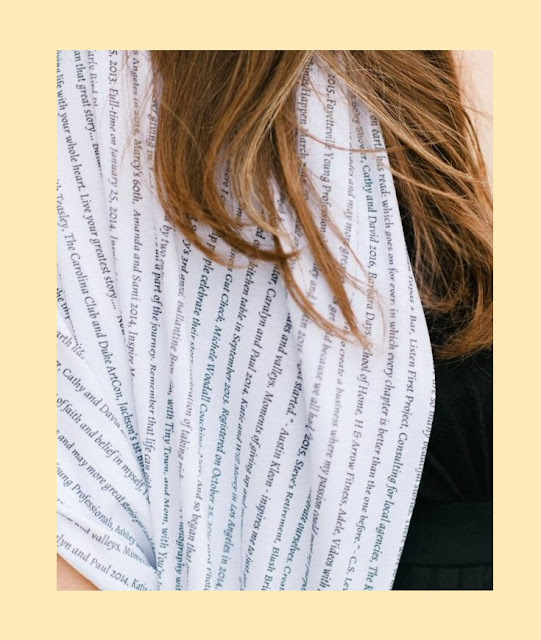 I especially like this idea because the fabric is all about text and words. (Can you tell I have a thing for fabric featuring text and words??) Read all about the project here. This one was made out of scanned images from newspaper clippings. Clippings of this sort will likely go by the wayside as the years pass, but I definitely have saved copies of old newspapers in my possession that could be put to use in this fashion. I can see something like this becoming a family heirloom. My latest design may also end up on a scarf at some point. The phrase is "keep a healthy body, a hopeful mind, and a happy [heart]". The above is one of the versions in a fat quarter view; the negative, repeating version at the top of this post is an 8" x 8" swatch. Here is another variation in a fat quarter view. This one is bi-directional so that it can be read from the top or bottom. This next project doesn't require sewing but may kick your home décor efforts up a notch. 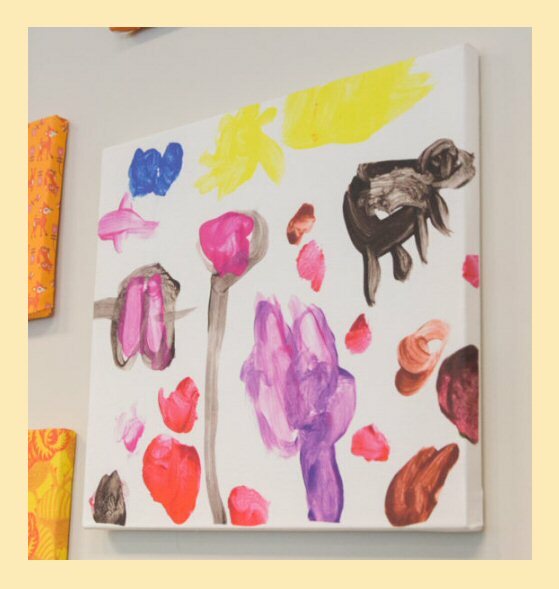 Take your kids' artistic creations and turn them into canvas art! If you don't have kids — or if your honest opinion of your kids' artwork is that it shouldn't be committed to anything permanent — you can do this with your own drawings or doodles. Or, how about mixing up the above ideas? The newspaper clipping project would be a unique piece of canvas wall art. And maybe your child's artwork would be more appropriately turned into a silk scarf? Similar to my P&P pillow project, your own fabrics can easily become conversation pieces when you feature them on sofa or bed cushions. They don't require a lot of fabric, so the cost of the projects is quite reasonable. Above are just two ideas, one for the holiday season and one for weddings. Here's another project that's destined to be handed down the generations. 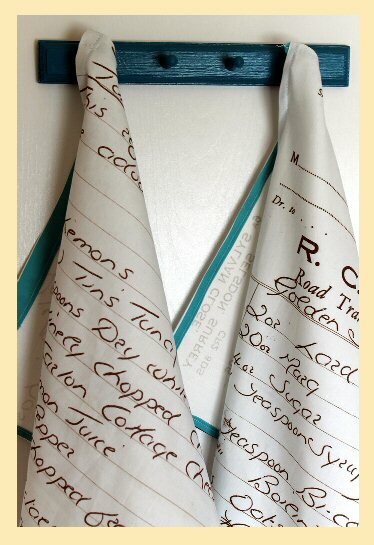 Recipe tea towels! Scan handwritten family recipes and turn them into fabric. I would probably just turn them into wall hangings, but I love the source. By the way, the use of handwritten source materials makes me think of using letters — you know, the old fashioned kind that no one really writes anymore? If you have special letters from your past, "collaging" them into fabric would be a unique way to save them forever. Looking for a smaller idea to start? This next one is also a "no sew" project. 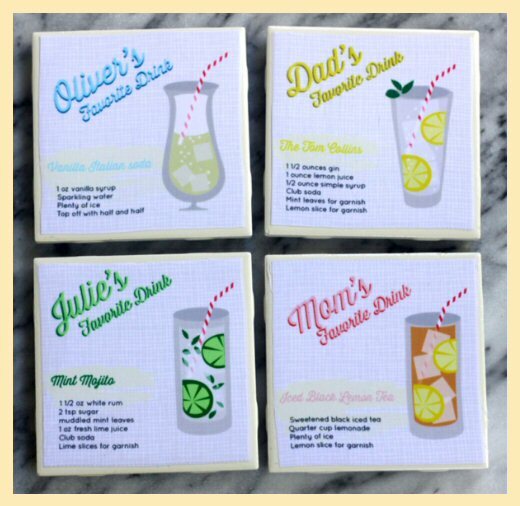 How about making personalized coasters for your family? Finally, here's one more version of my new fabric. This one looks more like a pattern than text at first glance, but it's the same phrase repeated and reversed (mirrored). I'm still playing with this design and may wind up with still other variations. 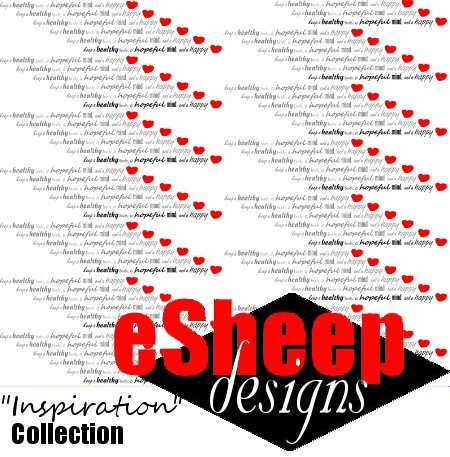 So have I given you some inspiration to start designing your own fabric? Still need that extra push? The offer you see here is for a one month membership for $1 that gives you access to everything on their site, allows you to keep one class of your choice, and gives you a 30% discount offer at Jo-Ann's (which, FYI, is only useful to those who live in the US). As for the class to keep, they have a five part, nine and a half hour How to Design Fabric class that's taught by three talented ladies and that gives you a peek inside the operations at Spoonflower. 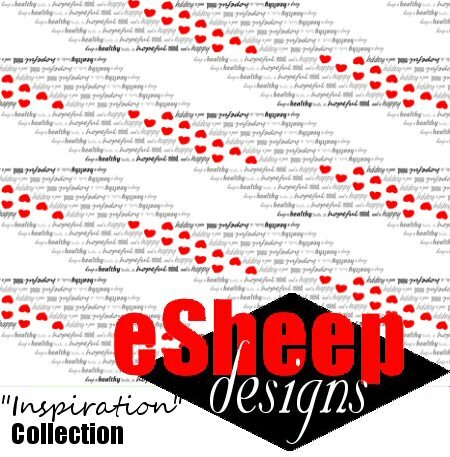 If you were wishing for a little bit of encouragement and some extra help to get you started on fabric design, what more economical way to get all that and more than spending — literally — a buck?? That kind of offer doesn't come around everyday, y'know! 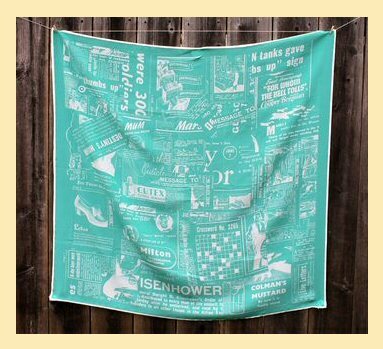 I have those tea towels and the scarf already Pinned - it's the text fabric again. The pashmina is most definitely cool, and I do like the coasters. You've most certainly given me some inspiration, Rochelle. 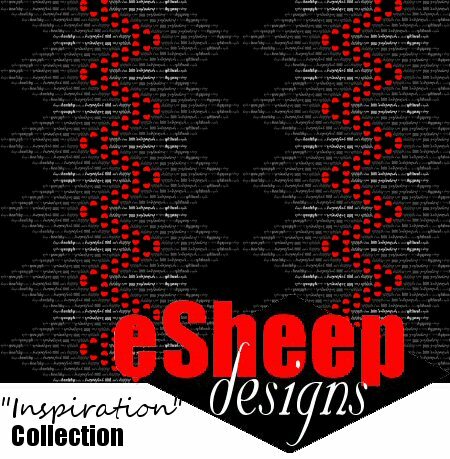 I'm loving the black, white, red combo of your new design. The way I prefer to design my own fabric is dyeing, painting, stenciling, stamping it. I could try and design a fabric like you did Rochelle and have it printed in whatever colorway I want and then others could buy it too, but I guess I am more like a kid that I would rather play with paints and such directly on fabric and then turn it into something. Having said that it has been a while since I did pull out the paints and do just that, even though I have been wanting to for a long time. I like your ideas and what you ave done with them. I love words on fabric and like your designs.